Ajax based multi operator chat software provides live communication among multiple clients and customer support executives through offline messages, conferencing, online chat event etc. Offline message can also be stored using multiuser chat utility. Professional multi operator chat script software provides online conversation among multiple customers and customer care executives. Multi operator help desk tool is very useful for improving online businesses like education, telecom, insurance, travel, auto sales etc. Multiuser live chat script tool has capability to reload page automatically using Ajax based refreshing so that user does not require refreshing page again and again at the chatting time. Online live chat application also provides help to store offline chat messages when operator is not available. Ajax based multi operator live chat utility facilitates administrator to know the website visitors IP address and host name during chat process. Free customer support software supports all windows operating system including Vista Home Basic, Vista Home Premium, Vista Business, Vista Enterprise etc. Multi operator live chat script utility prevents mischief user to enter into chat session. Online multiuser live chat software can be easily used without any extra hardware or software like DLL, plug-ins and java applets. Online customer support utility provides multilingual chat facility and also supports Unicode architecture. Multiple client real time chat software supports all popular internet web browsers like internet explorer with version IE 4.0 to IE 7.0 and other similar web browsers. Features: * Multi operator chat software facilitates customer support executives and clients for multilingual chat. * Ajax based multiuser live chat utility blocks unauthorized user to enter into chat session. 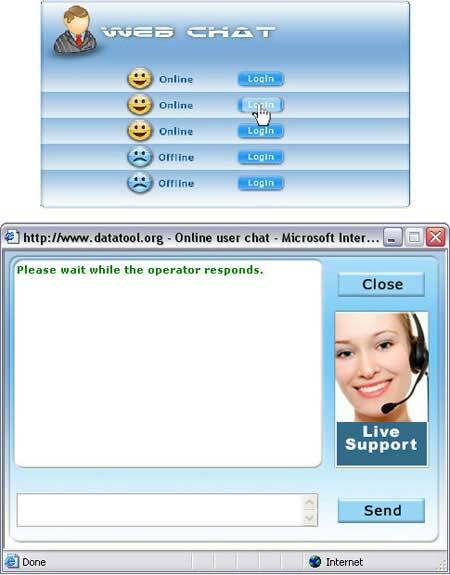 * Multi operator live chat script software supports all windows operating system including Vista. * Online multiuser chat software stores all offline chat records when operator is not present. * Multi operator chat application can improve small and large business productivity by increasing online products sale. * Multiuser web chat utility can track every website visitorÃ¢â‚¬â„¢s IP address and host name. Online chat software facilitates to website support executives to interact with online customers and respond to their queries through easy to use web based chat solution. Application shows chat history details including chat time and date etc. Chit Chat for Facebook enables you to send and recieve instant messages on Facebook Chat from your desktop like you would AIM or MSN. The Facebook Messenger supports chat history, wall posts, private messages and status updates. Pocket PC to sms broadcasting software transmit group of messages to all GSM and CDMA mobile phone from Windows based cell phone. Messaging tool sends unlimited sms to national and international cell phone networks without using internet connection. Write and read anonymous messages printed directly on the desktop. Or set it to receive from a closed group of people. This program is made for fun. Use it to say any thing you want anonymously. Flare some one, blow some steam. Tell a secret. etc. Comprehensive bulk SMS software for Android mobile phone users send unlimited messages in form of job alerts, product promotions, event messages, seasonal greetings, business advertisement, ads campaigns, inauguration invitations to other users. Advanced bulk SMS application facilitates with advanced option so that they can skip duplicate number entries. Professionally developed bulk SMS program provides user ability to save their sent messages to templates by enabling various options. Company presents mass text messaging application to communicate with worldwide GSM mobile phone users in cost effective manner with an option to connect USB modem with your PC and successfully deliver group SMS among multiple people at same time. GSM Modem USB software is especially developed and designed to broadcast personalized greeting text messages for wishing your student, relative, employee, customer, clients, relatives or business partners on New Year in easiest and cheapest manners. Innovative SMS via modem program empowers user to conveniently broadcast multiple quantity of business news and special discount offers to business leads and targeted audience from computer system with least amount of efforts required. Kreative SMS Broadcast-Applikationssoftware erfolgreich verÃ¶ffentlichen Masse Menge an persÃ¶nlichen und beruflichen individualisierte SMS an gewÃ¼nschte Handy-Nutzer durch einfaches AnschlieÃŸen Handy-GerÃ¤t auf Windows-Computer Maschine. Software professionale SMS invia il numero di massa di messaggi di testo con i migliori cellulari supporto procedura guidata connessione telefonica ad ogni passo della connessione cellulare e il messaggio processo di impostazioni. This site does not contain serial number, crack, keygen Multi Operator Live Chat Script serial number : serial number is the simplest type of crack. A serial number(cdkey,product key,etc) is register the program as you may already know. a crack or keygen may contain harmful software. If you cannot find the exact version you want, just give it a try. for more information read .nfo/.txt/.diz file include in zipped file.